The job market has not been heavily impacted by the rise of automation and artificial intelligence (AI) – not yet, at least. Despite dire predictions of wide-reaching job losses, the World Bank’s chief economist says there’s no reason to think robots will replace humans any time soon. 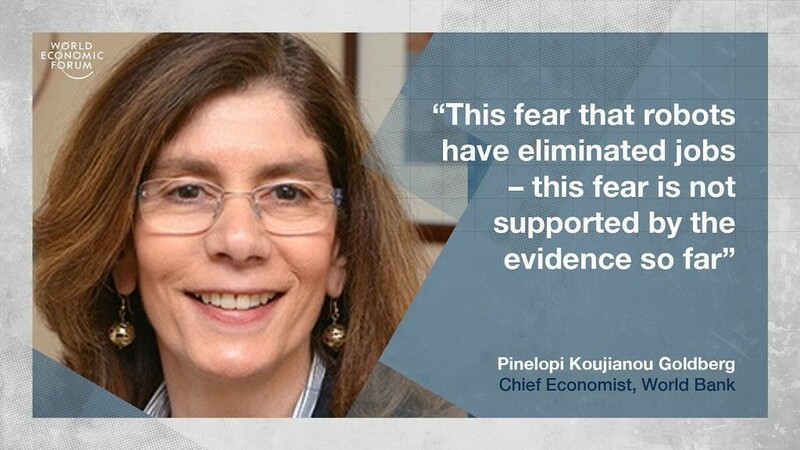 “This fear that robots have eliminated jobs – this fear is not supported by the evidence so far,” Pinelopi Koujianou Goldberg said in an interview with Bloomberg. This particular fear is, of course, not a new one. In the early years of the 19th century, a band of textile workers in Britain – the Luddites – took up a campaign of civil disobedience and unrest in the face of creeping industrialization and automation of their industry. While their grievance was related to wider economic challenges than merely the use of technology, most of us are familiar with their cause, whether we consider ourselves latterday Luddites or not. But the era of the Fourth Industrial Revolution has ushered in a new wave of concern. 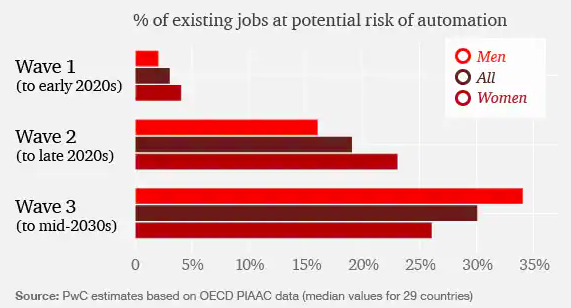 This was brought into sharp relief by the publication of a study from Oxford University which said, “according to our estimates, about 47% of total US employment is at risk” from automation. PwC’s prediction was less stark – a 3% risk of job losses in the early 2020s rising to 30% by the mid-2030s. What this perhaps highlights is that automation is not going to be defined by a single step-change in the way things are done. Rather, it’s likely to be a series of constant, iterative refinements; as the technology improves, the scope for it to automate new job functions will grow. “We need new ways to invest in people and to protect them, regardless of their employment status,” the World Bank’s President Jim Yong Kim writes in the foreword to The Changing Nature of Work, the Bank’s 2019 World Development Report. “With two billion people already working in the informal sector – unprotected by stable wage employment, social safety nets, or the benefits of education – new working patterns are adding to a dilemma that predates the latest innovations. Whether those predictions will be borne out is yet to be seen, but there is little question that the future of work is one where change will be the most significant influence. The World Bank’s Changing Nature of Work report is a clarion call to governments to rise to the challenge of that transformation. 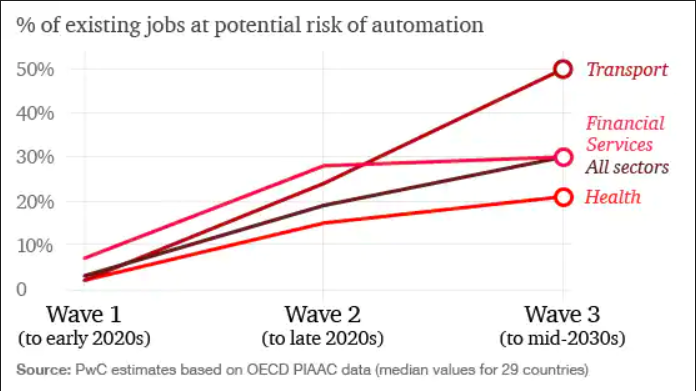 For when the World Bank’s Koujianou Goldberg talks of no evidence of job losses, she is looking at the overall picture; the extent of automation’s effect will differ from region to region and from country to country. The share of industrial employment dropped by more than 10% over the past two decades in countries including the UK, Spain and Singapore. This has been mostly as a result of the use of robotics and automation in the manufacturing sector, which has displaced large numbers of workers. In some cases, those former manufacturing workers have found employment in the service sector. But there are also pockets of left-behind communities in parts of the developed world, where several generations of families are adjusting to life without work. The New York Times columnist and Columbia University lecturer, Thomas Edsall, wrote recently that automation was hitting what he refers to as “Trump Country” particularly hard. “One of the most striking developments in recent decades is the ongoing decline in workforce participation among men, from 88.7% in July 1947 to 68.7% in September 2010.” Men without college degrees are more likely to be affected, he writes. Meanwhile, as parts of the developed world have seen a 10% fall in the overall share of industrial employment, the reverse has been true elsewhere. In Vietnam, for example, industrial jobs accounted for around 9% of employment in 1991 but had grown to 25% by 2017. It is perhaps no surprise that in many parts of Europe as well as in the US, there has been a resurgence of pro-nationalist, protectionist thinking and ideology as people worried for their economic security gravitate to what sounds like the most promising solutions to the challenges they face.